Dermaplaning, which is often also called epiblading, is a popular skin care treatment that can help give your skin a refreshed glow. Dermaplaning removes vellus hair (or peach fuzz) and dead skin while helping improve the appearance of your skin. Dermaplaning uses a medical grade scalpel to gently graze and exfoliate the surface of your skin. Though the scalpel may be intimidating, this treatment is painless, safe, and beneficial for all skin types. Our aestheticians at Belle Ross Spa & Salon in Southaven are trained in this treatment option and can help you get the glowing, smooth, and beautiful skin you want. Dermaplaning is a great treatment that is often paired with facials. This service can help products penetrate the skin deeper and allow them to be more effective. A dermaplaning treatment is a quick treatment that can give you rejuvenated skin in no time at all! Our dermaplaning treatments are each an hour long and is completely painless. After your dermaplaning treatment, you can return to your daily activities. There is no downtime, however, your face may appear slightly red for a few hours after your appointment. Make sure you stay hydrated and protect your skin from the sun after your appointment. This spa treatment can be done over your lunch break and allows you to return to work immediately after. This is a great treatment for quickly, safely, and efficiently improving the appearance of your skin. When you schedule a dermaplaning treatment at Belle Ross Spa & Salon, you can expect a treatment that will give your skin a youthful glow! We offer a variety of different dermaplaning treatments at Belle Ross Spa & Salon, allowing you to choose the treatment that will best benefit your skin. Our aestheticians can help you decide the best dermaplaning treatment for you. No matter which you choose, you can enjoy many different skin benefits. Enjoy a smooth complexion, glowing skin, and no more peach fuzz! If you are ready to schedule your dermaplaning treatment at Belle Ross Spa & Salon, contact us today! 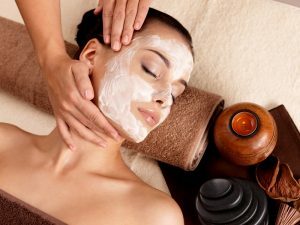 With this spa treatment, we will be able to provide you with glowing, healthy, and beautiful skin.